Our 4th-anniversary website building contest ended last week, and as you’ll know, if you read last week’s #WebsiteWednesday, we’ll be sitting down with each of the winners in the next 4 weeks to get a deeper view, not just of their .xyz sites, but of the creators behind them. This week we’re starting off with rising young developer Nadia Rodriguez’s handy mobile coding solution Codeful.xyz! 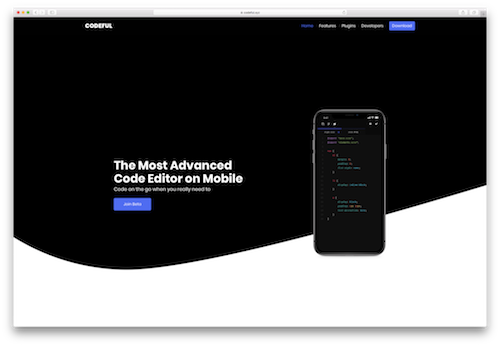 Our panel of judges loved Codeful.xyz’s sleek design and layout, as well as the very apt mobile coding solution it presents to a common problem developers face: the inability to code on-the-go. After sitting down to chat with Nadia, it was easy to see how her driven attitude toward coding led her to creating such a unique and useful site. XYZ: What inspired you to become a developer? Nadia: When I was in 11th grade, I took “Intro to Engineering” as one of my electives. My teacher eventually introduced us to coding. At this time, I had no idea what I wanted to do as a career, but after getting into HTML and CSS, I knew that I had found something that I really enjoyed doing. I started coding in class whenever I got the chance and started going through tutorials from codecademy, freecodecamp, w3schools, etc. Eventually, I got a laptop and started coding at home as well. What fascinated me was the ability to create something out of nothing. XYZ: Do you have a favorite project to work on? Nadia: I like working on personal projects the most. I do like working on client projects, but with personal projects you don’t have the same pressure. With personal projects, you don’t have any limits. You’re able to be 100% creative and the possibilities are endless. XYZ: Outside of coding, what are some of your favorite things to do? Nadia: Outside of coding, my favorite thing to do is spend time with my girlfriend and my family. I’ve also been trying to get in the habit of going to the gym (which I’ve been “trying” to do for a long time now). I don’t do much outside of coding other than that though, but I’m gonna try to change that! XYZ: Tell us a bit about your Instagram profile. Nadia: So in September 2017, I started realizing that there was a whole community of developers on Instagram. There were some profiles that I looked at and thought, “wow I want my feed to look like that,” or “well I wanna post about that, maybe I should!” So I decided to get out of my comfort zone and started posting about what I was learning development-wise. My first post was my Asus laptop hooked up to an ethernet cable, charger, and an external mouse and keyboard. I had just “hackintoshed” my laptop so that I would be able to learn iOS development. I then started writing on Medium, which I am planning to do more of as well since I only have 2 posts right now. When I started posting about development, I only had about 600 followers. Along the way, somehow people were actually liking my content. Now I have over 5,000 followers, which is still pretty unbelievable to me. To think that over 5,000 people looked at my profile and liked it enough to follow it is amazing. Growing on Instagram has led me to get my first client ever. It opened up so many opportunities that I am extremely grateful for. It has led to me to really grow even more as a developer. XYZ: Do you have any advice for the aspiring developers of #GenXYZ? Nadia: I was never good at advice, but I think it’s super important to not give up. You’re gonna come across a lot that you’ll have no idea how to do and you might feel like you’re not going to be able to figure it out. Development can be frustrating and, honestly, it will make you want to pull your hair out sometimes! But if you just keep trying, you’ll eventually figure it out, and when you do it feels like a huge accomplishment to just accomplish even that one small task. Also, don’t be afraid to get out of your comfort zone or to ask questions whenever you need help! XYZ: What made you choose .xyz for the Codeful.xyz website? Whatever it is that motivates you is worth not only pursuing, but sharing with others. Like Nadia, you can work on your passion and share it with others on your .xyz domain and take your ideas to the highest heights you can imagine. Ready to get started bringing your big idea to the world. Then get your own .xyz domain today and get started! « Previous Post See the winners of XYZ’s 4th-anniversary website building contest in this week’s #WebsiteWednesday!